The Biologics Price Competition and Innovation (BPCI) Act of 2009 established a “shortened” pathway for two categories of biological products that are demonstrated to be biosimilar to, or interchangeable with, a biological product – also called the “reference product” – for approval by the U.S. Food and Drug Administration (FDA). Thus far, all the biosimilar applications received by the FDA have been for biosimilars, not interchangeable medications. Inflectra, the second biosimilar for the U.S. market was approved by the FDA on April 5, 2016. Inflectra is approved for all but one of the indications held by the reference drug on which it is based, Remicade (infliximab). Approved indications for Inflectra include: Crohn’s disease, ulcerative colitis, rheumatoid arthritis, and some additional autoimmune conditions. The lone Remicade indication that Inflectra was not approved for is pediatric ulcerative colitis, for which Remicade’s patent exclusivity extends to 2018. This follows the approval of the first biosimilar for the U.S. market, Zarxio – reference drug, Neupogen (filgrastim) – in March 2015 for the same five indications as the original drug. Zarxio is indicated for patients with: cancer who are on myelosuppressive chemotherapy, acute myeloid leukemia who are on induction or consolidation chemotherapy, cancer who are having a bone marrow transplant, autologous peripheral blood progenitor cell collection/therapy, and severe chronic neutropenia. Additional biosimilar approvals on the horizon for 2016 are for patients undergoing cancer treatment: Epogen (epoetin alfa), which helps boost red blood cell production and Neulasta (pegfilgrastim), which does the same for white blood cells. FDA approval of these initial biosimilars is a hopeful sign for patients and payors, as these agents have the potential to increase competition and reduce the cost of treatment in the relevant therapeutic categories. However, estimates about the economic impact of biosimilars on the U.S. market vary widely depending on the number of projected approvals, the time frame for launch, and the projected market penetration following launch. In 2008, the Congressional Budget Office estimated that enacting the BPCI Act would reduce total expenditures on biologics by $25 billion between 2009 and 2018, with savings of $5.9 billion for the federal government alone. Savings would equate to about 0.5 percent of national spending on prescription medications, valued at wholesale prices over that same 10-year period. In 2014, another analysis from the Rand Corporation estimated that biosimilars would result in a $44.2 billion reduction in biologic spending between 2014 and 2024. More recently, the IMS Institute for Healthcare Informatics has published a report projecting that the global biologics market will exceed $390 billion by 2020. Of that total, biosimilars are projected to reach the market for reference biologic products with current sales of about $40 billion. Based on the analysis, biosimilars may account for up to 10 percent of the global biologics market by 2020, depending on the availability and adoption in the U.S., which is expected to be the biggest single market. As we seek to project the level of discount for biosimilars from the price of their reference products, it is important to recognize that biosimilars are significantly more expensive to develop than generic drugs. A generic typically takes two to three years and costs between $2 million and $5 million. By comparison, biosimilars take up to five years to develop and cost anywhere from $40 million to $300 million. Given these development costs and the dual categories created by the FDA – biosimilars and interchangeables – we do not expect biosimilars to provide the 70 percent to 80 percent savings we have seen with traditional generics. Typically, in Europe and other markets, biosimilars have been priced at a discount of 20 percent to 30 percent. Zarxio came to market in the U.S. at a 15-percent lower cost than its reference biologic. That means the price differential between a biologic and its biosimilar is more likely to approximate the competition in a multi-brand category of drugs rather than between a reference drug and its generic. Biosimilars have had a slow path to market in the U.S. One reason for this is the structural complexity of biologic medications. Unlike generic medications, in which the active ingredient is exactly the same as in the reference product, biosimilars are similar – but not identical – to the original or reference biologic. This is because a biologic medication is derived or harvested from living cells or organisms. It is composed of large, highly complex molecular structures, unlike a chemically derived medication. While some physicians (and patients) have raised safety concerns with respect to biosimilars, the decade-long experience with these products in Europe has shown no demonstrable increase in adverse events or other safety concerns. An important consideration for plan sponsors – and one often overlooked – is that once a biosimilar is approved, it may not make it to a market launch immediately, or even soon after approval. Zarxio, the first-approved biosimilar, came to market six months after its initial approval by the FDA. In many cases, outstanding patent litigation may delay market launch, just as it has for several traditional (non-biologic) medications. Once a biosimilar is launched, prescriber and patient acceptance is the next critical step in gaining adoption. In a 2014 survey of 405 U.S. health care professionals, including rheumatologists, oncologists, and primary care physicians, most had a poor understanding of the differences between biosimilars and generics, and between biosimilars and reference products. Ninety-seven percent of respondents requested continuing education on biosimilars. In addition, clinicians may be more likely to initially prescribe biosimilars to a treatment-naïve patient than to transition an existing patient from a reference drug to its biosimilar counterpart, another study found. The increasingly complex landscape of biologic medications and biosimilars means there is a need to have a robust approach to member and provider education, cost and trend management, and methods for encouraging uptake of biosimilars. For payors electing one of our template formularies, new biosimilars, like Inflectra, will be subject to a new-to-market block upon launch and only unblocked after considering a range of factors including price and expert opinion/specialty consultant input on clinical considerations. Our approach to maximizing the savings potential of biosimilars, as with other therapy classes, is to utilize competition to help drive the lowest net cost for payors. We may do this by encouraging uptake of the biosimilar as the lower-cost alternative or by leveraging the biosimilar to drive a lower price for the reference brand. We also recommend payors consider additional strategies to maximize savings. Effective plan design can help mitigate the impact of tools like copay cards and drug coupons reference brand manufacturers use to drive brand loyalty. We recommend including low- or zero-dollar copay tiers for lower cost biosimilars or very high tiers for non-preferred reference brands. Currently there is no pathway for biosimilars to have the legal definition of interchangeability – meaning a pharmacist cannot automatically dispense a biosimilar at the pharmacy without a change in prescription, even though biosimilars are therapeutically equivalent to biologics. This means a formulary or step therapy approach is needed to drive new prescriptions to the preferred agents. Because biosimilars are therapeutically equivalent to reference biologics, we expect minimal “grandfathering of patients.” To drive uptake of biosimilars, we recommend patient and provider education and frequent communication to current users of branded reference products. With the recent approvals of the first two biosimilar agents, we are entering a new era in the management of specialty pharmacy. While the precise competitive dynamics of the biosimilar market are still evolving, there are clear areas where we recommend clients focus, from a strategic perspective, to maximize the opportunity for cost reduction that biosimilars may represent. At CVS Health, we utilize competition in a therapy class to help drive the lowest net cost for payors. For biosimilars, we plan to do this by either utilizing the biosimilar as a more cost-effective alternative to the reference brand, or by utilizing the competition presented by a biosimilar to seek deeper discounts from the reference brand manufacturer. Manufacturers of the reference biologic brands use copay coupons and other tools to minimize patients’ out-of-pocket costs and to encourage brand loyalty. Effective plan design, including low- or zero-dollar copay tiers for lower-cost biosimilars, or very high tiers for non-preferred reference brands can help mitigate the impact of coupons. 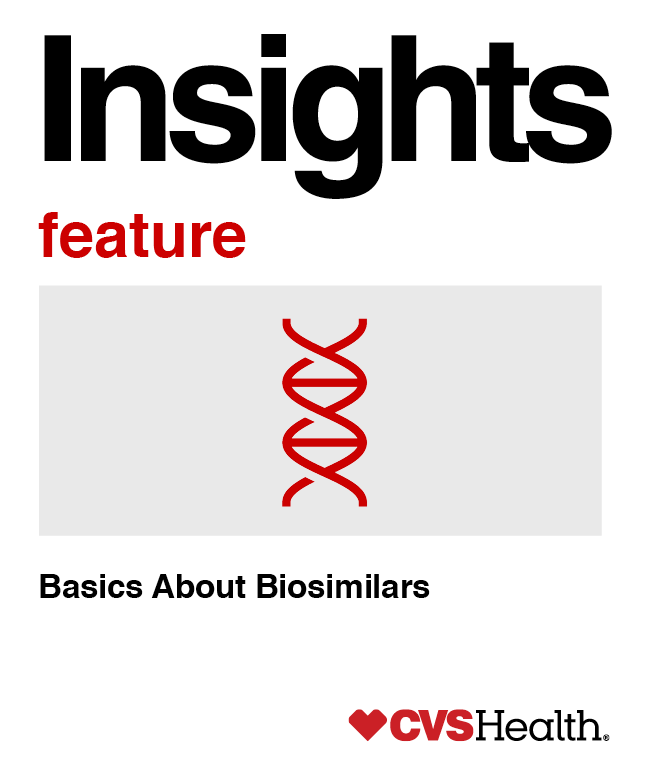 Currently there is no pathway for biosimilars to have the legal definition of interchangeability – meaning a pharmacist cannot automatically dispense a biosimilar at the pharmacy without a change in prescription, even though biosimilars are therapeutically equivalent to biologics. This means a formulary or step therapy approach is needed to drive new prescriptions to the preferred agents. Our data clearly shows that exclusion formularies generate the lowest net cost by helping to maximize discounts from manufacturers, and increasing market share for the preferred product. "Grandfathering" of reference brands allows patients who are stable on a particular drug to remain on that drug. While we will review each category individually biosimilars are clinically equivalent to their reference brands and have the same mechanism of action. We therefore expect minimal need to ‘grandfather’ patients. We will implement patient and provider education to ensure effective uptake of biosimilars. This will also require frequent communication to current users of branded reference products. We will work closely with our clients to maximize the share of the preferred products and help members understand the benefits of biosimilars. Biosimilars are adding choices to the biologic market, but with that choice comes complexity. We will be with our clients every step of the way, utilizing a thoughtful and flexible process to help them attain the greatest value for their specialty drug spend. The Insights Feature is intended to support our clients in understanding and managing the impact of new marketplace developments to help them achieve their goals of lowering costs while improving the health of their plan members. You can subscribe to the Insights Feature by emailing insights@cvscaremark.com. Projections based on analyses performed by independent entities. Actual results will vary depending on plan design, formulary status, demographic characteristics and other factors. Client-specific modeling available upon request. Information related to prospective drug launches is subject to change without notice due to market events and other factors.